Replaces stock plastic steering links included on the Axial AX10 RTR’s and SCX10 RTR’s. This kit will increase steering strength and precision. Includes machined aluminum steering links. Ideal for the AX90017 – XR10. Fits all Axial 72-103mm shock sets. New springs add more tuning options to the already existing spring rates. Machined from high-grade carbon fiber. Plate is height adjustable and includes all the hardware allowing the battery to be positioned as low as possible. Machined from high-grade 3mm carbon fiber. Allows for a lightweight mounting platform for your electronics. Carbon Fiber Electronics plate is 65% lighter than the factory electronics tray. Replacement upper and lower links for the XR10. This kit provides added clearance and performance for the XR10 Chassis. 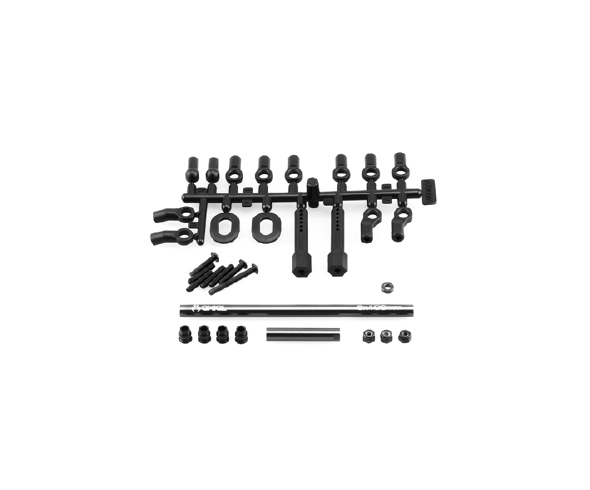 Kit includes (4) AX30469 Machined Hi-Clearance links for the lower suspension links and (4) AX30519 Aluminum 30° Bent Pipes for the upper suspension links.